Mikko Hypponen on the cyberattacks article in "Ch@nge"
The ongoing data revolution drives the establishment of a comprehensive cultural habitat that induces the framing of ordinary life issues in terms of data availability and the data permutations this encourages. These same developments are linked to the understanding of the process of knowledge creation as predominantly computational operations performed upon large data volumes. Placed in a wider historical purview, these trends seem to indicate a cultural transition of wider dimensions that attest to the rising importance which formal, data-based models of cognition acquire as a means of knowing and experiencing the world. These observations acquire poignant importance these days, as the result of the diffusion of computational models of cognition that inevitably accompany the growing involvement of information artefacts in human experience. In what follows, I claim that the relatively recent developments that coincide with the pervasiveness of data in most walks of life refigure the balance between the sensible and the intelligible and accentuate the typically modern preponderance of formal models of cognition over perception and situated experience (Borgmann 1999, 2010; Couldry and Kallinikos 2017; Flachbart and Weibel 2005). Essential strips of reality are increasingly mediated and acted upon by means of digital marks (e.g. data) and the extraction of abstract or analytic relations between human and things that data and information enable (Borgmann 1999, 2010; Hayles 2005, 2006). The recent debate on big data and the advent of data science (see e.g. Brynjolfson and McAffee 2014; Pentland 2014) are indicative of these trends and of a cultural and social change of wide proportions. In thus, intervening in living and knowing, data and data-driven analytics drive experience away from the associative gestalts of perception, sensation and intuition, and the knowledge built on observation, trial-and-error and world involvement or acquaintance (Alaimo and Kallinikos 2017; Ayres 2007; Kallinikos 2011). The perception of the world is always linked to what Rosch et al. (1976) call basic concepts or categories by which human communities order their world impressions. Basic objects or categories are units of the social and natural world abstract enough to achieve an economy of perception yet tied to the palpable reality of things. For instance, a basic object such as a “chair” subsumes the differences underlying a variety of types of chairs but it can still be perceived and experienced as a tangible object of a particular materiality and shape. This is opposed to the concept of “furniture” that helps us apprehend a population of domestic objects (chairs, tables, drawers, etc.) in terms of the function they perform by grouping them together into a more inclusive and thus abstract entity. While recounting some of the earlier worries concerning the impact of computing on human practices (see e.g. Dreyfus and Dreyfus 1986; Winograd and Flores 1986), the claim I put forward is not precisely concerned with the ill-fated prospects of experientially-based knowledge and skills that have commonly been subsumed under the label of tacit knowledge. The problems I seek to pinpoint are of a rather different nature, even though they have far reaching implications for expert knowledge and the ways it is acquired and exercised (Ayres 2007; Ekbia and Nardi 2017; Shirky 2008). Let me explain. Advances in computing power, methods of computing and machine learning all hugely expand the type of tasks that can be addressed and successfully resolved by machines. At the same time, the unprecedented uptake of lightweight technologies, the diffusion of digital platforms and social media grant the current online environment a social dimension that was only vaguely present in the early Internet, analysed by such insightful scholars such as Borgmann (1999), Dreyfus (2001) or Turkle (1995). It is worth pointing out that the environment of social media and the Internet more generally construct a comprehensive living and knowing habitat that stretches far beyond the work and professional settings in which information technology and its cognitive outputs (i.e. data) have commonly been studied (Kallinikos 2011; Zuboff 1988). Taken together, these developments establish a cultural context that increasingly quantifies daily pursuits and induces the framing of ordinary life issues in terms of data and whatever relations can be inferred out of the crunching of large data volumes across lay and expert cultures (Alaimo and Kallinikos 2017). This is, on many counts, an epochal transformation through which the marks of a digital culture (data and data relations) crowd out the immediate reality of personal experience, experiential knowledge and situated interaction. Even though depersonalization and the diffusion of formal methods of living and knowing have been intrinsic to modernity (Borgmann 1984, 1999; Giddens 1991), the current developments differ in some important respects that are worth of being observed and analysed. In the rest of this paper I try to provide a few analytic arguments that expose some of the issues that data-based cognition raises for lay and expert cultures. Next section goes into some detail in describing the importance which data and the technical models through which they are analysed assume in knowledge development and expert practices. Following it, I endeavour to show how the proliferation of data items combines with the diffusion of computer-based devices across the social fabric to construct new forms of experience, in which a wide spectrum of daily life issues are increasingly framed in terms of data and data relations. In the last section, I place my argument in a broader social science purview and confront a few widespread positions that are reluctant to accept the interpretation of the current developments in the terms I discuss here. Massive data generation is the distinctive mark of our age, and data availability its holy grail (Ayres 2007; Pentland 2014; Kallinikos 2007). If only available, data are assumed to be able to tell us who we are, what exactly is the profile of our preferences beyond our delusions, or how our body feels even if our awareness fails to register its condition; how markets and organizations work, what friends to choose and what communities to join; what travels, mortgage or insurance to undertake this year, what flights may be cheaper today, what stocks to invest over the coming few months, which films or plays to see this week and what tunes to listen, how to drive to a destination in the urban mazes of modern cities and so forth. This is only a small list of a quickly expanding population of issues that are claimed to be successfully addressed by data crunching. The common assumption underlying these claims is that, if rightly perused, the data that are massively and meticulously captured and stored everyday in all walks of life would be able to illuminate personal, social and natural realities and address an impressive array of issues confronting contemporary people and societies. A large range of technologies and services are already in place (Ayres 2007; Brynjolfsson and McAffee 2014; Ekbia and Nardi 2017; Pentland 2014). Visitors look at installations by artists Paolo Cirio and Alessandro Ludovico at the Big Bang Data exhibition at Somerset House on December 2, 2015 in London, England. 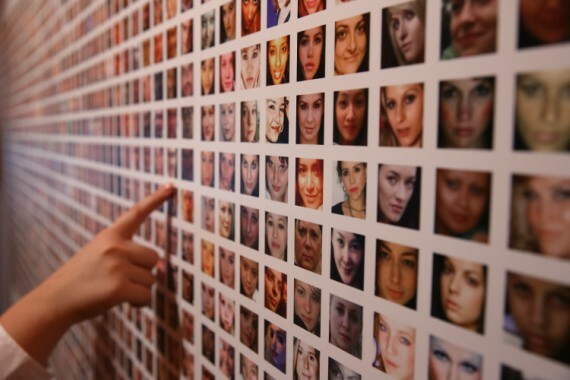 The exhibition showcases the data explosion that’s radically transforming our lives. While many of these issues may appear trivial, their implications are not. As I claim in some detail in the next section, conducting an essential portion of ordinary dealings by relying on solutions or recommendations produced out of available data by machines considerably reframes everyday patterns of living and signifies an important change in longstanding human habits (Alaimo and Kallinikos 2016, 2017). The implications of the use of data extend, however, beyond the restructuring of daily living and impinge upon economic relations and behaviours by means of diffusing new ways of creating, distributing and monetizing value (e.g. Brynjolfsson and McAffee 2014; Parker et al. 2016). They further impact upon core institutions and institutional relations. Reconstructing, for instance, the profile of people’s preferences by means of computing data provided by Internet surfing habits and social media is an intricate practice with serious institutional and legal repercussions (Boyd 2014; Hildebrandt and Gutwirth 2008; Hildebrandt and Rouvroy 2011). How people are related to their data raises serious epistemological but also ontological questions. Am I solely my data? In what other ways can I be known; What else am I or might be? Who has the right to know my data? These serious and perplexing matters bring us to the fundamental question of data and truth and, by implication, place us at the centre stage of contemporary science and its institutions (Khalidi 2013). There is some evidence to suggest that scientific practice increasingly becomes entangled with the production and computational manipulation of data in ways that far outstrip empiricism’s reliance on facts (see, e.g. Borgmann 1999, 2010; Couldry and Kallinikos 2017; Flachbart and Weibel 2005). The first step in this process of ‘data-basing’ knowledge development is the comprehensive mapping of reality through the technological generation of huge amounts of data. An important part of such data corresponds to the footprint of the online pursuits of humans, another part results from the systematic recordings of facts and performances in fields such as medicine, law, education, finance or city traffic and still another from those technological advances that are referred to as the Internet of Things (Brynjolfsson and McAffee 2014; Pentland 2014). The data that thus become available are subsequently subjected to elaborate statistical, computer-driven, techniques of data aggregation and computation that are assumed able to expose the underlying regularities of reality. The ordinary assumption is that larger volumes of data lead to more adequate descriptions of reality and this is what renders the quest for data the holy grail of much scientific and expert practice. Visitors look at installation Ryoji Ikeda (below) at the Big Bang Data exhibition at Somerset House on December 2, 2015 in London, England. 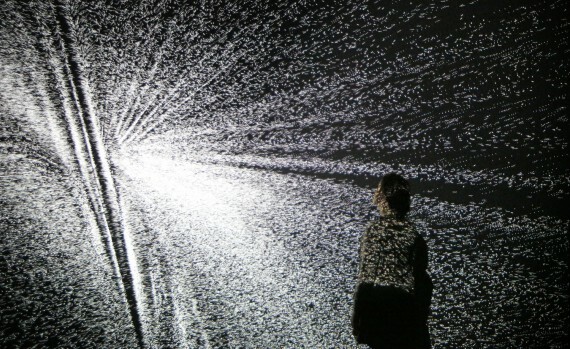 The exhibition showcases the data explosion that’s radically transforming our lives. Under these conditions, the development of knowledge through big data and the scientific practices it supports refigure not simply the role of perception in human life but also key conceptual habits and traditions of scientific research and practice. Data recording and the statistical permutations performed upon large volumes of available data move far away from theory and the use of concepts as essential means for unravelling the opaque constitution of reality. No theory is needed to detect patterns in the data. On this view, the patterns, if there are any, should emerge from bottom-up processes of data manipulation and clustering through a range of statistical techniques that have been currently assigned the prestigious name of data science (Pentland 2014). Some of these epochal shifts have been popularised early on by the information age guru and then editor-in-chief of Wired Chris Anderson. In an article in the journal, Anderson (2008) provocatively predicted the end of theory and of scientific knowledge in the standard sense of conceptual development linked to evidence of one or another type. Anderson’s claim is simple, perhaps even simplistic, but has the merit of straightforwardly conveying a central problematic of the age. Due to greater data availability and more accurate data, the reliance on theory and conceptual frames, he claimed, will eventually decline and knowledge will finally be derived inductively and exclusively through correlations performed upon huge masses of data.3 The age in which data without theory meant noise is over, says Anderson, putting new oil in the empiricism/rationalism fire burning over centuries. In this post-empiricist context, not only perception, even conceptual analysis (or at least a vital part of it) is rendered redundant. Cognition in the form of data analytics increasingly takes command. Nature and social reality are regained, if ever, after a long analytic retreat, out of the cognitive dust of computational particles (data) (Kallinikos 2009). The ordinary assumption is that larger volumes of data lead to more adequate descriptions of reality. Last October, agricultural consultancy Lanworth not only correctly projected that the US Department of Agriculture had overestimated the nation’s corn crop, it nailed down the margin: roughly 200 million bushels. That’s just 1.5 percent fewer kernels but still a significant shortfall for tight markets, causing a 13 percent price hike and jitters in the emerging ethanol industry. When the USDA downgraded expectations a month after Lanworth’s prediction, the little Illinois-based company was hailed as a new oracle among soft-commodity traders-who now pay the firm more than $100.000 a year for a timely heads-up on fluctuations in wheat, corn and soybean supplies. The USDA bases its estimates on questionnaires and surveys-the agency calls a sample of farmers and asks what’s what. Lanworth uses satellite images, digital soil maps and weather forecasts to project harvests at the scale of individual fields, it even looks at crop conditions and rotation patterns-combining all the numbers to determine future yields. 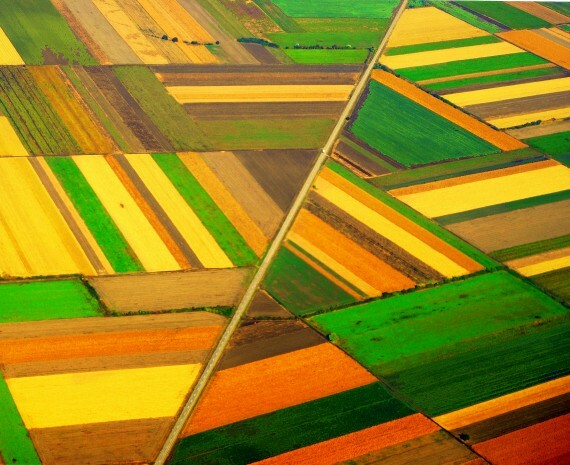 This rather colourful case illustrates how the developments I discuss here lift a field such as agriculture, traditionally immersed in the obstinate reality of nature, out of its physical embedment. It is important to observe that such a shift is made possible by: 1) the remarkable expansion and aggregation of data sources about the conditions on which food crops are dependent and 2) the calculation of future yields on the basis of statistical techniques of data aggregation and analysis. The remarkable expansion of data is the outcome of technological advances of reality documentation (satellite images, digital soil maps, weather forecasts), far beyond any human perception and register capacity. They are also contingent on the (technological) ability to lump up these data into databases or data repositories of standardized tokens that thus make them portable across data sources and possible to aggregate and crunch by statistical techniques. There are undeniably blind spots, hidden assumptions and simplifications in these stories of scientific journalism. One could certainly question the degree to which they represent an adequate description of the processes of knowledge development and expert practice. However, the technological trends that make data such a pervasive element in knowledge development and expert practice and the computer based statistical techniques of data aggregation and analysis they are associated with are hard to dismiss (see, e.g. Ayres 2007; Brynjolfsson and McAffee 2014; Pentland 2014). Even though these trends can be differently interpreted, it would seem as a displaced gesture to question the current importance of data and the technological revolution through which data are made a vital component of economic and institutional life. Gradually, technology is moving into areas that historically have remained on the sidelines, as is the case of agriculture, which has been strongly impacted. These same technological changes acquire a poignant importance in the current settings of daily living. Quantitative techniques have no doubt been ubiquitous in modernity (e.g. states, markets and corporations) but they failed to deeply penetrate personal, domestic and community life. This is no longer the case. Several developments that were alluded to above combine to establish new habits and a context of social interaction that differ from earlier contexts of daily living, including the context of the early Internet. It is worth looking at them in a little bit more detail. An important development over the last decade so coincides with to the unprecedented uptake of lightweight technologies, such as smart phones and tablets, by large population segments. Lightweight technologies do not simply link large masses of people to the Internet. Crucially, they establish a convenient space of use, whereby a great deal of people’s pursuits is lifted out of the ordinary contexts of living and placed in the stimuli and action environment of the various online settings characteristics of the current Internet. These changes are, however, only the visible and immediate outcome of the developments I refer to. Less evident is the datafication of daily living, consequent upon these technological advances. Every click that lightweight technologies enable people to perform in the multiple online environments to which they hook them is transformed into data. Used skilfully and innovatively by digital platforms and the wider business ecosystem of the Internet (e.g. advertisers, marketers, data analytics companies, start-ups), these data form the basis for constructing an entirely new context of behavioural relevance made of relations between data items, essentially abstractions. For instance, by relating a user’s preferences qua clicks to the clicks of other uses, important digital stakeholders can advance personalised services and recommendations that put ordinary processes of preference formation such as observing, talking and imitating at bay. An entirely different behavioural context is thus established in which the ordinary stimuli of perception and embedded living are undergoing a radical transformation. A second group of developments that distinguish the current Internet from earlier contexts of daily life, including the context of the early Internet, is associated with the diffusion of social media and the massive migration of people’s daily pursuits in the online platforms social media command. It wouldn’t be an exaggeration to claim that social media are eating away the ordinary contexts of domestic, community and civic life (Alaimo and Kallinikos 2017; Borgmann 2010; Gerlitz and Helmond 2013) and create entirely different environments in which people carry on their daily pursuits. Similar to the diffusion of lightweight technologies with which they are anyway closely connected, social media engineer an online stimuli and action environment (e.g. liking, tagging, sharing) in which each action performed by human users is made a countable click and used together with the clicks of other users to construct profiles of persons and advertising audiences, or political audiences out of online communities and groups. New forms of personal and social experience are thus derived from the data footprint of the engineered social interaction of social media and fed back to people in the form of personalized services, targeted advertising and recommendations (Alaimo and Kallinikos 2016; 2017; Couldry and Kallinikos 2017; Van Dijck 2013). The dissemination of lightweight technologies and the diffusion of social media platforms are, as briefly alluded to above, closely related to one another. It is hard to imagine the lively and constantly updatable context of social media platforms without smartphones while the acquisition of such devices is often driven, at least in younger segments of the population (Boyd 2014), by the desire to join what may seem as the vibrant world of social media. The two trends are, no doubt, separate and should be distinguished from one another. Both, however, impact and reconstruct the forms of action, communication and experience that have been characteristic of modernity and of the early Internet. These developments are further amplified and reinforced by yet another trend that is popularly referred to as The Internet of Things (IoT). In many respects, the IoT offers a straightforward and vivid example of the transition I seek to describe in this chapter. Through the IoT the bulky appearance of things and their obstinate reality are transformed into a mass of computable marks (i.e. data) that are deployed as the basis for developing a range of services to both human users and other machines of the domestic complex. Such services are thus no more than data relations extracted out of the meticulous recording and datafication of human use of domestic appliances and utility networks and other mechanical settings that industrial capitalism bequeathed us and which the IoT currently expands. These developments forcefully indicate that people’s daily and domestic habits are increasingly lifted out of the ordinary contexts of daily living and accordingly inserted in an environment in which they are framed, understood and monitored as tokens or cognitive inputs for building abstract relations. For first perhaps time in history, technology in the form of computation is extensively involved in the framing of life issues, as predominantly issues of information and communication possible to address by computational means. The transformation of human perceptual and cognitive habits analysed above and the move away from immediacy and perception is of course a pervasive theme in modern scholarship. Much has been written about the effects of writing and literacy on culture, human thinking and perception (see e.g. Beniger 1986; Gardner 1985; Goody 1977; Hoggart 1957; Mumford 1934, 1952; Ong 1982). There is also significant scholarship on the advent of numeracy and the effects numbers and quantification have had on humans, and the culture and institutions characteristic of modernity (see e.g. Cline-Cohen 1982; Desrosières 1998; Hacking 1990; Porter 1995). The growing social involvement of writing and the diffusion of numerical systems have considerably redefined the role of perception and cognition in human affairs. Both literacy and numeracy have given data a stronger importance in personal and social dealings and progressively instigated new habits that have given priority to abstract modes of reasoning and abstract relations at the expense of immediacy and perception. A case can further be made concerning the effects which industrial capitalism has produced over the course of the last century on domestic life and human experience more generally through the production of goods and technologies that have reordered the significance of what are commonly called local realities. Placed in a historical purview, the diffusion of industrial appliances and goods across the social fabric remade the infrastructural basis of everyday living and profoundly altered the contours of personal and cultural experience (Borgmann 1984; Giddens 1991; Heller 1999). Current developments certainly continue, deepen and expand the effects which literacy and numeracy, writing and quantification and industrial capitalism have had on cognitive habits, modes of reasoning, experience and culture (Beniger 1986; Kallinikos 2011). However, the shifts I seek to depict in this text are, if not of a substantially different nature, distinct enough to warrant attention. The diffusion of data along with the technological nexus in which data production and use are inscribed establish a context that tends to frame a large array of cultural, economic and behavioural issues as cognitive problems of either computational or navigational nature. These developments, I suggest, signify a deepgoing redefinition of many social practices and daily habits of living comparable perhaps to the life styles that diffused as a sequence of industrialism and mass production. The issues this historical comparison evokes are of course different. The redefinition of everyday living brought about by the ongoing data revolution features the prominence of formal and abstract models of cognition, as distinct from physical devices, and the concomitant retraction of perception as the axial principle of everyday conduct (Borgmann 2010; Alaimo and Kallinikos 2017; Hayles 2005, 2006). Literacy and numeracy have given data a stronger importance. Even in the case of the portrait I have painted in this chapter is taken as a valid depiction of contemporary developments, it would seem legitimate to raise objections as regards the kind of impact these developments may have on human practices and institutions. Can one really assume the unified refraction of these trends across the social and institutional fabric? Do not people and institutions appropriate these developments, interpret and remake them to fit their realities? After all, the changes I describe in this paper occur against the background of thick cultural and institutional relations that variously condition the introduction of new technologies and whatever habits these may propagate. The developments I have singled out in this chapter are and will undeniably be refracted across fields and professional domains of contemporary life in different ways; medicine, for instance, is different from agriculture, architecture from law or the running of a business. Each of these institutional domains confronts specific problems. In addition, each one addresses these problems by historically specific ensembles of knowledge, skills, traditions and practices (Kallinikos and Hasselbladh 2009). Given, thus, the distinctive profile of problems, skills and practices underlying each one of these domains, it makes sense to assume that the implications of the developments I refer to are bound to manifest differently across them (see e.g. Lessig 2006; Terzides 2005). This is no doubt in this case. But the varied impact which data, big data and data analytics may have upon different social fields is a manifestation of wider changes that also require attention and critical analysis. The comprehensive and deepgoing character of the developments I point to alters important premises on the basis of which reality is conceived, punctuated and addressed and expertise enacted. It does so in ways that are generic enough to transcend the specificities of particular domains of social life (Kallinikos 2011). A new institutional reality is brought about by these techniques and ways of construing and assessing problems and situations in which data availability and data analytics prevail. In this regard, the reality outlook of computation and the techniques of capturing, storing, making available and analyzing data transcend the confines of particular social fields and the professional practices by which these are associated (Kallinikos and Hasselbladh 2009) and remake some of the basic premises on the basis of which facts are produced, made available, assessed and addressed across markets and institutions. By the same token, the forms of expertise intrinsic to each professional domain (e.g. medical, legal, economic, architectural) are changing in ways that seek to accommodate the computational rendition of reality I have been at pains to describe in this text (see, e.g., Hamburg and Collins 2010; Siemens and Long 2011). Though differently, these developments carry implications, I have claimed, for the lifeworld and the patterns of everyday life. They cast human living in a complex environment in which data availability and the computations it encompasses increasingly provide the coordinates of daily life patterns. Again, the individual or collective appropriation of these life styles and patterns inevitably entails the re-contextualization and situated interpretation of abstract and freely circulating data tokens. It is beyond any doubt that individuals and groups transform and complement the generic and de-contextualized solutions mediated by technologies (Esposito 2004). Yet, by the same token, they become accomplices in the framing and sampling of the world these technologies, and the services they enable, mediate (Heidegger 1977, 1998). Re-contextualization (and interpretation) is double act that changes not only what is re-contextualized, but also the agents of re-contextualization. Seen in this light, the tasks and patterns of daily life that have predominantly been shaped by all those qualities and faculties we associate with human experience are subject to change, as computational techniques infiltrate the everyday living habitat. This seems to me an important shift in which the front-and-backstage (the tacit, unconscious, forgettable, beyond awareness) of human living change position. Demonstration in Honk Kong, 2014. 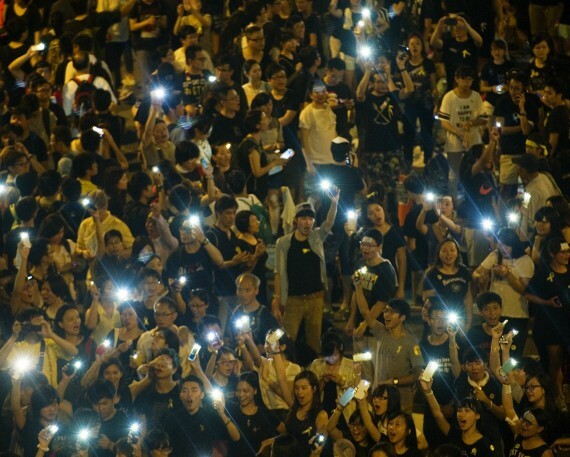 A mobile messaging app that does not need Internet to work becomes the main headache for the Chinese authorities. In other words, the technological and cultural developments I describe in this chapter exhibit generic attributes that cut across specific contexts of social and institutional life. These generic attributes ¾ which I have identified with the prominence of cognition over perception, the preponderance of information and computational principles in defining reality ¾ cannot be wished away by the widespread rhetoric of technological appropriation, technological malleability or contextual adaptation that has become common over the last few decades (Bijker 2001; Bijker et al. 1987; Orlikowski 2000). They need to be conceptually decomposed and studied empirically with the view of exposing the distinctive ways through which they are manifested, change and fuse into the fabric of social practices. Alaimo, C. and Kallinikos, J. (2016) Encoding the Everyday: The Infrastructural Apparatus of Social Data. In Big Data is not a Monolith: Policies, Practices, and Problems, ed. Sugimoto, C., Ekbia, H. and Mattioli M. 77-90. Cambridge MA: MIT Press. Alaimo, C. and Kallinikos, J. (2017) Computing the Everyday: Social Media as Data Platforms, The Information Society, 33/4: 175-191. Anderson, C. (2008) The End of Theory, Wired, July. Anderson, J. R. (1983) The Architecture of Cognition. Cambridge, Mass: Harvard University Press. Ayres, I. (2007) Super Crunchers: How Everything can be Predicted. London: Murray. Beniger, J. (1986) The Control Revolution: The Economic Origins of the Information Society, Cambridge, Mass: The MIT Press. Bijker, B. (2001) Understanding Technological Culture through a Constructivist View of Science, Technology and Culture, in Cutcliffe, S.&Mitcham, C. (eds. ), Visions of STS: Counterpoints in Science, Technology and Society Studies. New York: State University of New York. Bijker, W. E, Hughes, T. P.&Pinch, T. (eds.) (1987). The Social Construction of Technological Systems. Cambridge, Ma: The MIT Press. Borgmann, A. (1984) Technology and the Character of Contemporary Life: A Philosophical Inquiry. Borgmann, A. (1999) Holding On to Reality: The Nature of Information at the End of the Millennium. Chicago: The University of Chicago Press. Borgmann, A. (2010) Orientation in Technological Space. First Monday, 15(6). Boyd, D. (2014) It’s Complicated: The Social Lives of Networked Teens. New Haven: Yale University Press. Brynjolfsson, E. and McAfee, A (2014). The Second Machine Age: Work, Progress, and Prosperity in a Time of Brilliant Technologies. New York: Norton. Cassirer, E. (1955) The Philosophy of Symbolic Forms. New Haven: Yale University Press. Cline-Cohen, P. (1982) A Calculating People: The Advent of Numeracy in Early America. Chicago, IL: The University of Chicago Press. Couldry, N. and Kallinikos, J. (2017) Ontology, in The Sage Handbook on Social Media, Burgess, J., Marwick, A. and Poell, T. (eds.). London Sage. Desrosières, A. (1998) The Politics of Large Numbers: A History of Statistical Reasoning: Cambridge, MA: Harvard University Press. Dreyfus, H. (2001) On the Internet. London: Routledge. Dreyfus, H. and Dreyfus, S. (1986) Mind Over Machine. New York: Free Press. Ekbia, H. R. and Nardi, B. A. (2017) Heteromation, and Other Stories of Computing and Capitalism. Cambridge: Mass: The MIT Press. Esposito, E. (2004). The Arts of Contingency, Critical Inquiry, 31, http://criticalinquiry.uchicago.edu/features/artsstatements/arts.esposito.htm accessed 23 of December 2010. Gardner, H. (1985) The Mind’s New Science. New York: Basic Books. Gerlitz, C. and Helmond, A. (2013). The Like Economy: Social Buttons and the Data-Intensive Web. New Media&Society, 1-18. Gibson, J. J. (1986) The Ecological Approach to Visual Perception. New York: Psychology Press. Giddens, A. (1991) Modernity and Self-Identity, Cambridge:Polity Press. Goody, J. (1976) The Domestication of the Savage Mind. Cambridge: Cambridge University Press. Hacking, I. (1990) The Taming of Chance. Cambridge: Cambridge University Press. Hayles, C. (2005) Computing the Human, Theory, Culture and Society, 22/1: 131-51. Hayles, C. (2006) Unfinished Work: From Cyborg to Cognisphere, Theory, Culture and Society, 23/7-8: 159-66. Heidegger, M. (1977) The Question Concerning Technology and Other Essays. New York: Harper. Heidegger, M. (1998) Traditional Language and Technological Language, Journal of Philosophical Research, XXIII: 129-145. Heller, A. (1999) A Theory of Modernity. Oxford: Balckwell. Hildebrandt, M. and Gutwirth, S. (eds) (2008) Profiling the European Citizen. Springer. Hildebrandt, M. and Rouvroy, A. (eds) (2011), Law, Human Agency, and Autonomic Computing: The Philosophy of Law meets the Philosophy of Technology. London: Routledge. Hamburg, M. A. and Collins, F. S. (2010) The Path to Personalized Medicine. N Engl J Med, 2010(363), 301-304. Hoggart, R. (1957) The Uses of Literacy: Changing Patterns in English Mass Culture. Essential Books. Jay, M. (1994) Downcast Eyes: The Denigration of Vision in Twentieth-Century French Thought. Berkeley: University of California Press. Kallinikos, J. (2007) The Consequences of Information: Institutional Implications of Technological Change. Cheltenham: Elgar. Kallinikos, J. (2011) Governing Through Technology: Information Artefacts and Social Practice, New York: Palgrave/MacMillan. Kallinikos, J and Hasselbladh, H. (2009) Work, Control and Computation: Rethinking the Legacy of Neo-institutionalism, Research In the Sociology of Organizations, 27: 257-282. Kallinikos, J., and Mariátegui, J. C. (2011) Video as Digital Object: Production and Distribution of Video Content in the Internet Media Ecosystem, The Information Society, 27(5): 281-294. Khalidi, M. A. (2013) Natural Categories and Human Kinds: Classification in the Natural and Social Sciences. Cambridge: Cambridge University Press. Mumford, L. (1934) Technics and Civilization. San Diego: HJB. Mumford, L. (1952) Arts and Technics, New York: Columbia University Press. Nardi, B. and Kow, Y. M. (2010) Digital Imaginaries: What We (Think We) Know about Chinese Gold Farming, First Monday, 15: 6-7, June. Ong, W. J. (2013) Orality and literacy. London: Routledge. Orlikowski, W. J. (2000) Using Technology and Constituting Structures: A Practice Lens for Studying Technology in Organizations, Organization Science, 11/4: 404-428. Parker, G. G., Van Alstyne, M. W.,&Choudary, S. P. (2016) Platform Revolution: How Networked Markets Are Transforming the Economy. New York: WW Norton. Paynter, B. (2008) Feeding the Masses, Wired, July. Pentland, A. (2014) Social Physics: How Good Ideas Spread-the Lessons from a New Science. Penguin. Porter, T. (1995) Trust in Numbers: The Pursuit of Objectivity in Science and Public Life, New Jersey: Princeton University Press. Rosch, E., Mervis, C. B., Gray, W. D, Johnson, D. M. and Boyes-Braem, P. (1976), Basic Objects in Natural Categories, Cognitive Psychology 8: 382439. Rouvroy, A. (2011) Technology, Virtuality and Utopia, in Hildebrandt, M. and Rouvroy, A. (eds), The Philosophy of Law meets the Philosophy of Technology: Autonomic Computing and Transformations of Human Agency, London: Routledge. Siemens, G. and Long, P. (2011) Penetrating the Fog: Analytics in Learning and Education, EDUCAUSE review, 46(5), 30. Shirky, C. (2008) Here Comes Everybody. London: Penguin. Terzides, K. (2005) Algorithmic Architecture. London: Elsevier. Turkle, S. (1995) Life on the Screen: Identity in the Age of the Internet. New York: Simon and Schuster. Van Dijck, J. 2013. The Culture of Connectivity: A Critical History of Social Media. New York, NY: Oxford Universtity Press. Winograd, T and Flores F. (1996) Understanding Computes and Cognition. Norwood, N. J: Ablex Publishing Corporation. Zuboff, S. (1988) In the Age of the Smart Machine: The Future of Work and Power. New York: Basic Books. 1 Some may find the distinction I make between perception and cognition overstated. Little wonder, perception is essential to cognition and the abstract operations that underlie cognition whereas the cognitive templates underlying cognition furnish as important receptacles to the activities of attention and perception. By perception, then, I predominantly mean situated observations and experiences that differ from sheer sensations in the sense of entailing cultural mediations that do not, however, evolve into deliberate mental exercises. The distinction cannot be drawn unproblematically, but it does have the merit of placing perceptual and cognitive operations at a different distance from ostensive reality. 2 For more details see Hamburg and Collins (2010) and Siemens and Long (2011). 3 Chris Anderson, The End of Theory, Wired, July 2008. 4 Ben Paynter, Feeding the Masses, Wired, July 2008. 5 All italics are mine. Kallinikos, Jannis. "Reality Regained: And Inquiry into the Data Age." In The Age of Perplexity. Rethinking The World we knew. Madrid: BBVA, 2017.